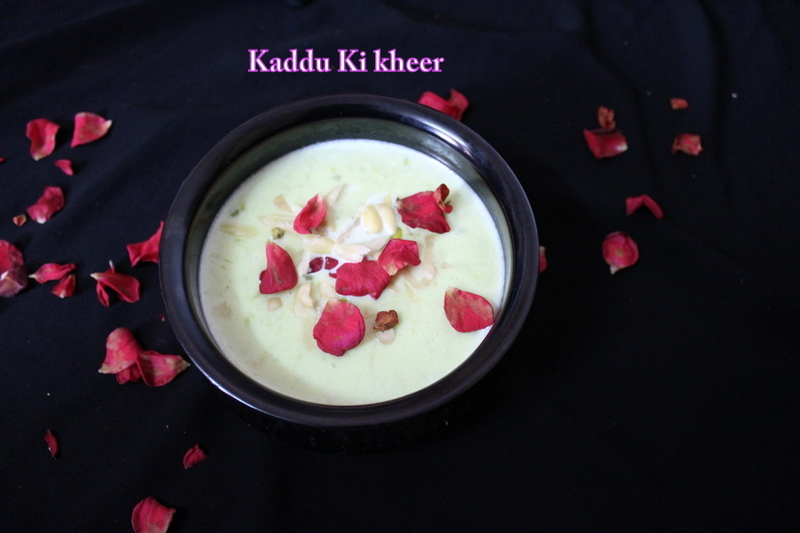 Kaddu ki kheer is a hyderabadi special dessert made using milk and kaddu. This can also be called as lauki ki kheer and kaddu is a term for lauki in hyderabadi lingo. Other hyderabadi drinks or desserts on the blog are sheer khurma, moong dal halwa, suji ka halwa, semiya payasam, khubani ka meetha, phirni recipe, chaas recipe, badam milk, badam milkshake, lassi punjabi, gajar ka halwa with condensed milk, fruit custard . 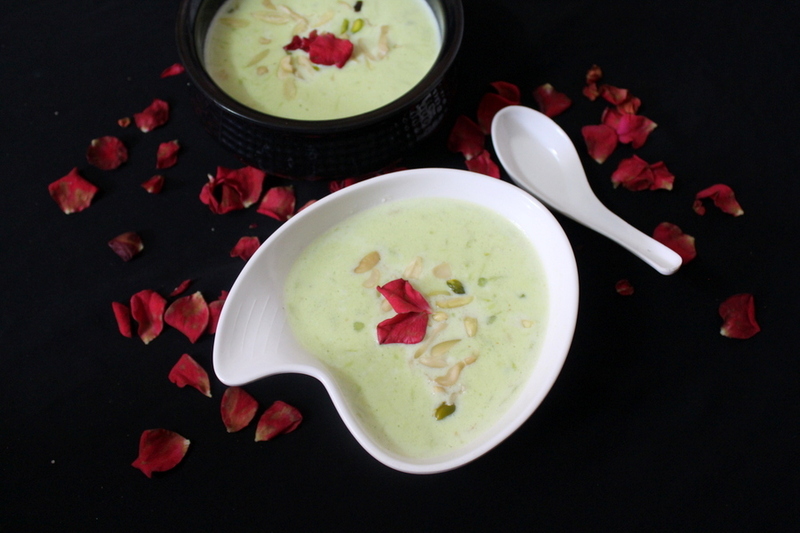 It is a special dessert and a favorite of every muslim made in every hyderabadi household. It is a very rich, delicious, creamy dessert loaded with heavy ingredients and is one of my favorite desserts. It takes in a lot of time to make this dish in a traditional manner. 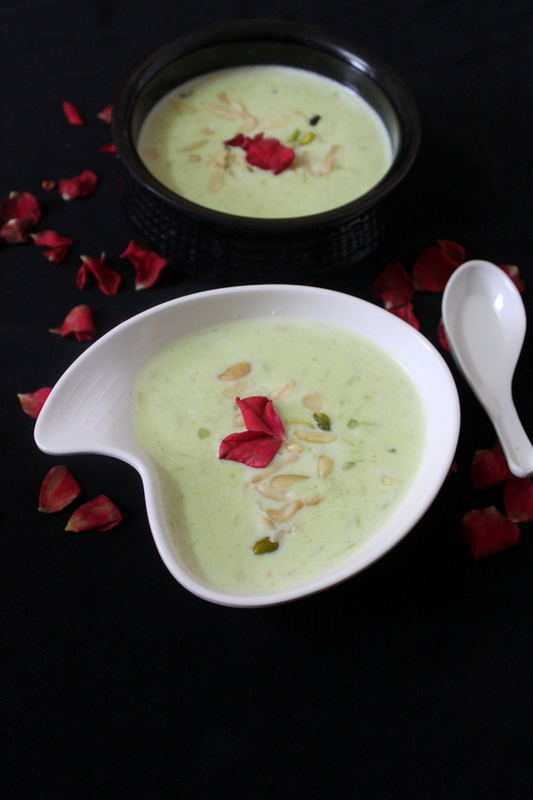 It requires full fat milk, basmati rice flour, milkmaid, khoya, cashewnut paste and many more ingredients which makes this dessert a creamy and flavorful dish. It is usually found in many occasions like muslim ceremonies or weddings in hyderabad. 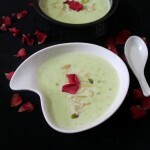 I have tried to share the details of almost the same kind of kaddu ki kheer recipe made usually in hyderabad. Being a hyderabadi I am quite familiar with the ingredients that go into making this wonderful and amazingly delicious dessert. Its a bit time consuming process to make this dish, we need to get ready with all the ingredients readily available before making it. Though it takes time, the outcome of the dish pays off. 1.Cook the bottlegourd by adding little water and make it soft as it takes time to get cooked in milk. 2.To make this recipe we need to first soak the sabudana for few hours until it bulges out and gets soft. Soaking sabudana reduces the time of making kheer. 3.Soak the basmati rice for an hour, drain it completely, dry the rice and then coarsely powder the rice. This step too reduces the cooking time of kheer. 4.If dry fruits are to be added, blanch them in water, peel them and slice them finely to garnish at the end. 5.These are main ingredients and if used in this way , they reduce the time of making the kheer recipe. Rest of the making procedure is very easy if instructions are followed carefully. A hyderabadi special dessert made using milk and lauki along with rich ingredients like cashewnut paste and khoya. Firstly, in a pan, add grated kaddu/bottlegourd. Into it, add 1 cup water and cook the kaddu until all the water is absorbed and until it gets soft. In a separate non stick pan/wok, add milk and bring it to a boil. Stir it for 5-10 minutes on low flame. Add cooked bottlegourd/kaddu into the milk. Stir and cook for 5 minutes on low flame. Add soaked sago/sabudana, mix and keep stirring and cook for 5 minutes. Add basmati rice flour, mix, keep stirring for another 5 minutes. Add cashewnut paste, mix and stir for 5 minutes. Add milkmaid and mix it well. Add khoya mixed with milk, mix and cook by stirring for few minutes. Add sugar as per requirement, mix and cook for another 5 minutes. Add cardamom powder, green food color, mix well and stir well. Cook for 5 minutes on low flame. Chill the dessert in refrigerator for few hours. While serving add a drop of vanilla essence, mix and serve. Garnish with sliced dry fruits and serve.